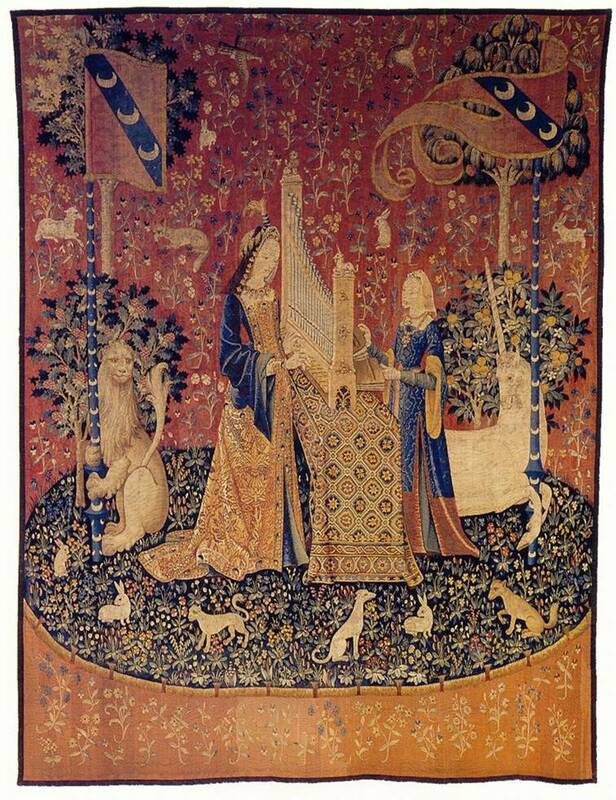 The cluny museum in Paris is famous for its 6 tapestries about a Lady and a Unicorn. The tapistries were found (discovered) by the French dramatist, historian and archaeologist Prosper Merimee (he wrote the book Carmen, on which Bizet’s opera was based), and his friend George Sand, in the Chateau de Boussac in the Limosin district of France. 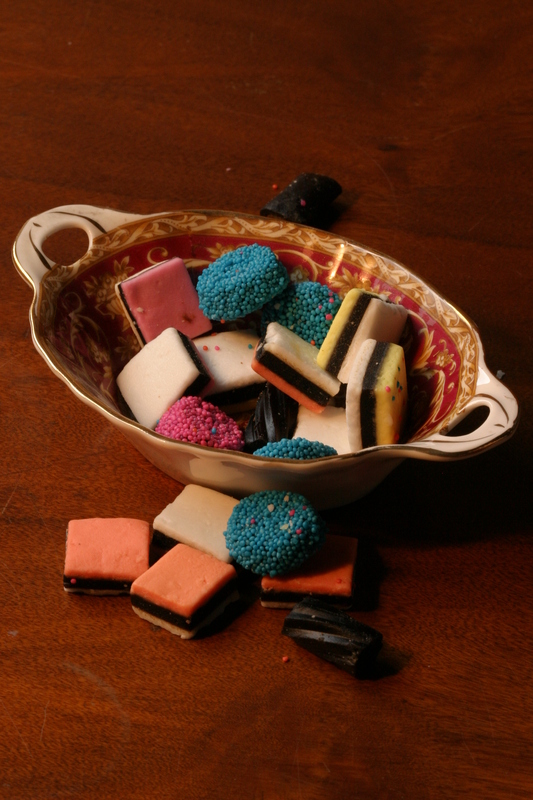 The “official” interpretation of the tapistries is far too Victorian and moralistic to my taste, as it was manufactured in the 15th Century. According to the Cluny, the lady is displaying the 5 senses – touch, sight, taste, smell and hearing, while in the last (first) panel she is divesting herself of earthly goods for a chaste life devoted to religion. Depicted on the panels are various animals, trees, objects and a background of mille fleurs (thousand flowers)typical of decoration in this style. Besides the young lady the other central figure is that of the Unicorn. The unicorn is not a mythological character, but was always thought to be a natural, albeit extinct animal. There are even references to the unicorn in the Bible, and in Greek texts, where it was thought to come from India. In medieval writing the unicorn was thought to represent chaste love and faithful marriage (Petrarch). The animal had the power to determine whether a young girl was a virgin, and only a gentle and pensive maiden had the power to tame a unicorn, this being the way the animal was trapped -by using such a maiden as bait. It must be remembered that medieval man was illiterate, thus much more visually literate than we are. They understood and expected a painting, illustration, or stained glass window to tell its “story” with the use of symbols and metaphors that were objects from everyday life that they knew. This makes it very difficult for us to read today, as these meanings have been lost, but at the same time we have the opportunity to interpret them any way we wish! 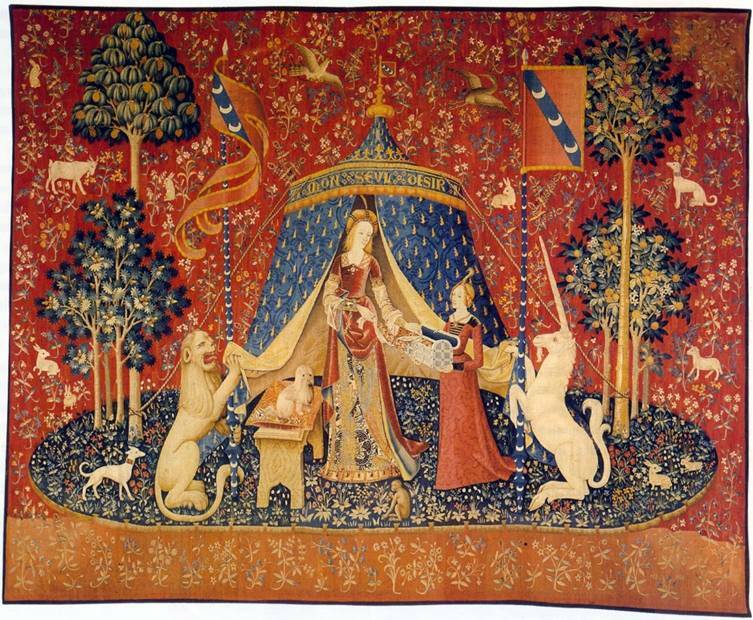 I think that the tapestries are describing the “gentle and pensive maiden”. She who appreciates the virtues and value of the finer things in life – she enjoys music and can play an instrument, she has a taste for good food, loves flowers and fresh smells. She is clearly high-born, surrounded as she is with symbols, the dog, monkey, birds. She is beautiful and richly clothed. Could the tapestries be extolling her virtues to a prospective husband? Does the prospective husband see himself in the role of the wild, exotic unicorn? It is the last (first) tapestry that holds the key. She seems to be preparing to give up something precious, and I think it is her virginity. I am currently working on ideas about my own interpretation of the panels, and have started by taking photographs of some of the found objects in my collection. These objects represent something of the popular culture of my and my mothers contemporaries, and thus their special value can be “read” by many people, though each one will have their own memories and own interpretations. 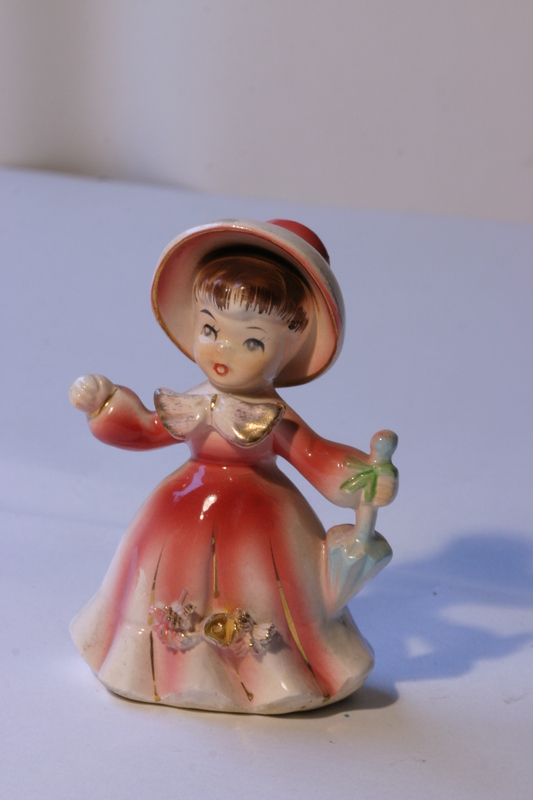 I found a cute little shepherd girl made of clay, and she will be my “lady”. 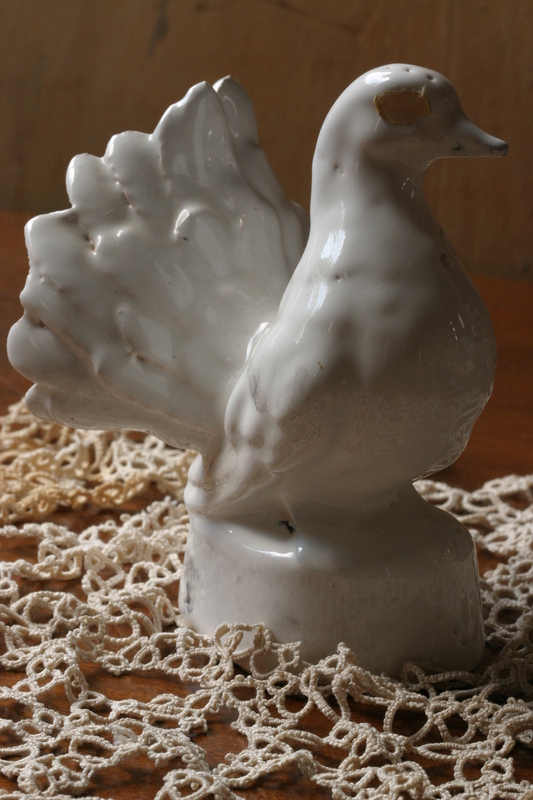 Other clay objects, like the dove, and the small bowl of liquorice allsorts, will possibly help to embroider more details as I draw and think. I will keep you posted with scrapers as and when I finish them.